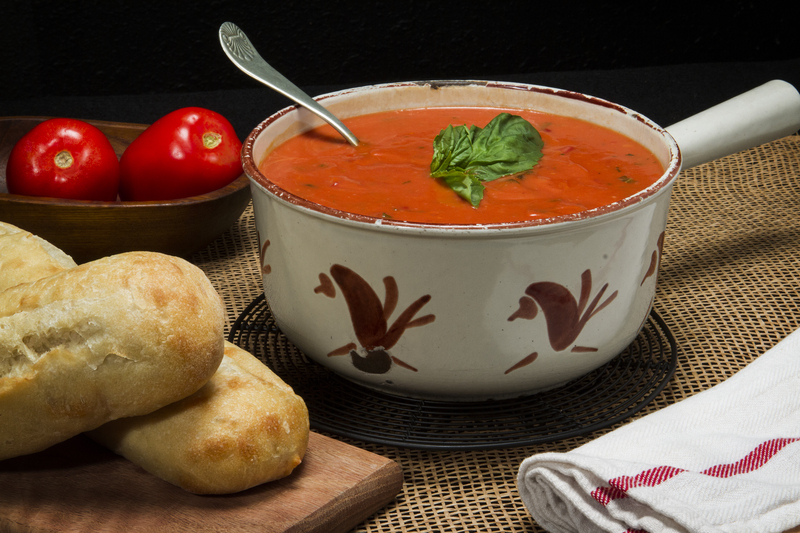 Featuring Country gravy mix, this is a 1-2-3 using canned tomatoes and fresh basil and garlic. Homemade goodness for any cost conscious homemaker. In a 4-qt stock pot add diced tomatoes and garlic; allow to come to a simmer. Add tomato puree, fresh chopped basil, white pepper and nutmeg. Allow mixture to simmer on low for 10 to 15 min, stirring from time to time. While tomato mixture is cooking, in a small sauce pot bring 3 cups of water to a boil, then whisk together in a measuring cup the gravy mix and one cup of cold water. Add this to the boiling water and whisk briskly. When the tomato mixture is fully cooked, add the cream gravy using a whisk. Adjust consistency with a little water as needed. Serve immediately, or this soup holds well in double boiler.